Following right on the tracks set by Barbie’s Glamour Camper Van comes Barbie Sisters Go Camping! Camper. It seems the great outdoors is one of Barbie’s favourite places, and now she has the ultimate in camping luxury with a vehicle in which take all her sisters for a long holiday in the country. Packed full of exciting play features, the pop-up second floor even has room for two sheltered hammocks for the girls to relax and read a book, or just chill out and snooze after their journey. When its meal time the luxury kitchen has room for Barbie and sisters Chelsea, Skipper and Stacie to sit and enjoy a relaxing meal, whilst the pull out spa tub is just great for easing all those aching joints. Barbie Sisters Go Camping! Camper even comes complete with the girl’s favourite little puppy dog, feeding bowl and a special wheel hub cap that doubles as a doggie bed! When night falls and it’s time for bed, the front seat of the camper folds flat for ultimate luxury, and a built in shower and toilet ensures that all the girls can camp in style! Every Barbie fan will want one of these Barbie Sisters Go Camping! Camper. 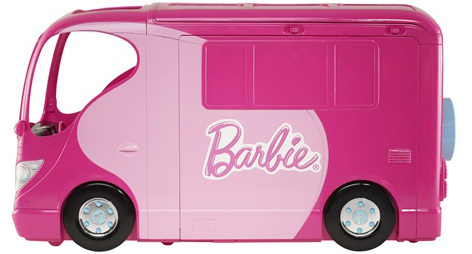 Please tell us what you think of the Barbie Sisters Go Camping Camper by Barbie and Mattel. I love that toy that I want it right now! My daughter Cristy loved that the whole family was included and everything worked well. It was easy to clean and use, but there was only two spaces she could use as a bed and it was expensive for the size.